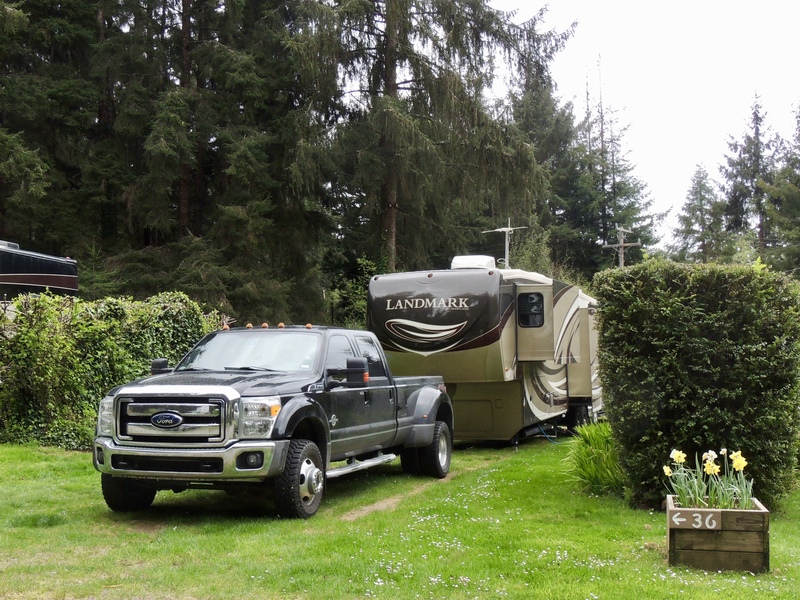 Yesterday was the first full day of our week-long stay at Azalea Glen RV Park, just north of Trinidad, CA, about 30 miles north of Eureka. Because AT&T cell phone service had been spotty at our last campsite, Cheryl had a number of phone calls she needed to catch up on, as well as future plans to research. So with heavy rain in the forecast for the next several days, I decided to spend the afternoon exploring nearby Patrick’s Point State Park. 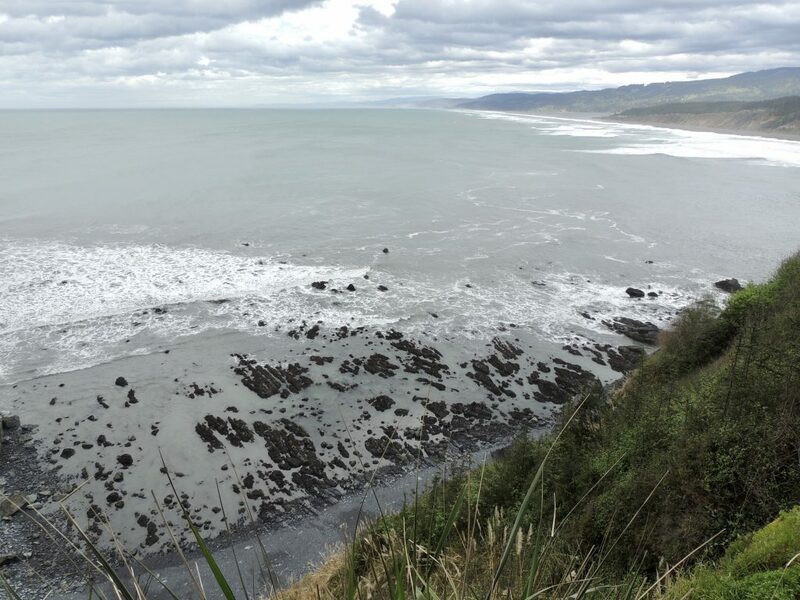 Patrick’s Point is a densely tree- and meadow-covered headland that juts into the Pacific Ocean. The entrance to the park is just a few hundred yards down the road from Azalea Glen, so I walked there from our house. The park charges an $8 per vehicle entrance fee, but it’s free if you walk in. Tall trees at the entrance to Patrick’s Point State Park. Note the sign at bottom right for scale. I stopped by the Visitor’s Center to pick up a trail map, and then headed for the coastline by way of the reconstructed Sumêg Village. 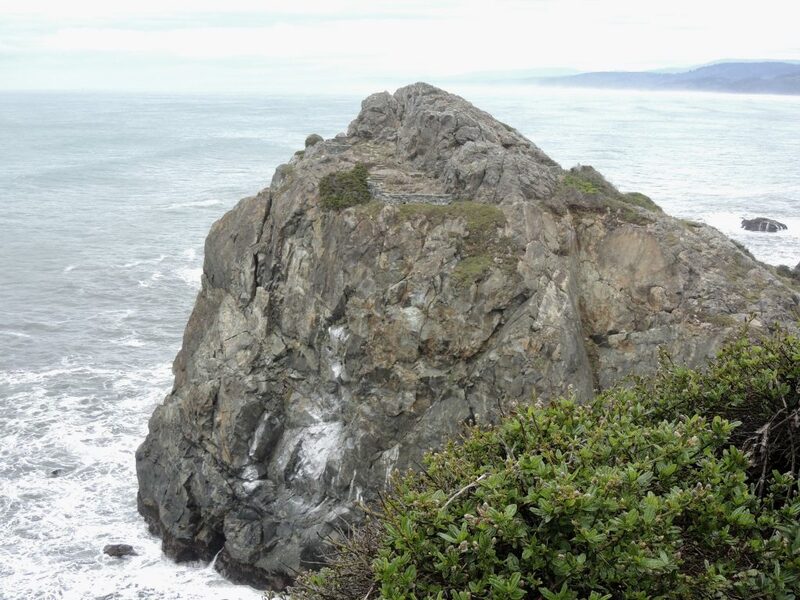 Until the mid-1800s, the Yurok Native Americans lived in this area, enjoying the temperate climate, fishing for salmon from dugout canoes, hunting game, and gathering roots and berries. 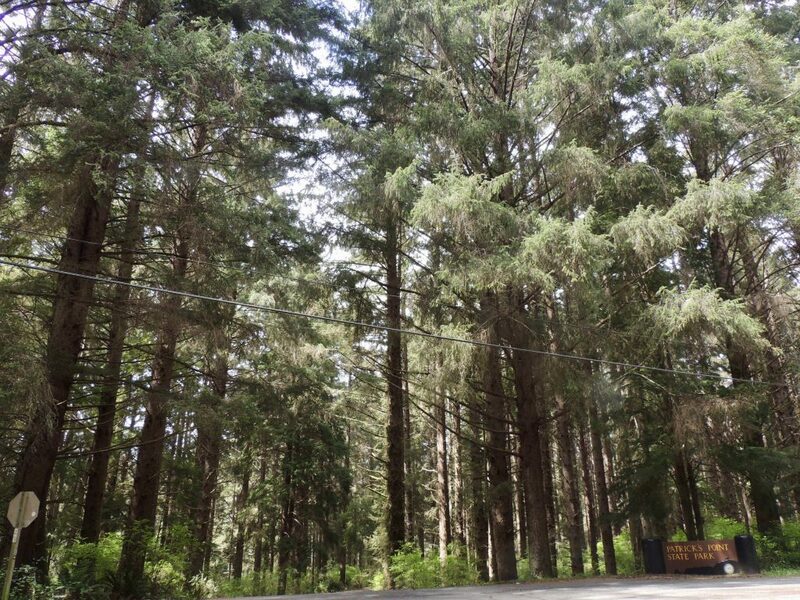 After being decimated by settlers during the gold rush and later years, the Yurok recovered somewhat, and today are the most populous tribe in California, with almost 5,500 Yurok now living in the area. In 1990, they constructed Sumêg Village in Patrick’s Point SP. 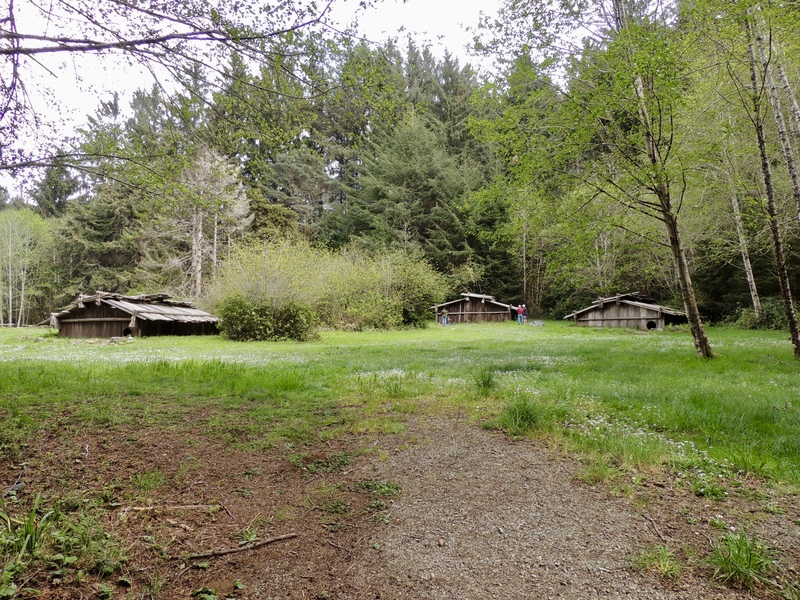 Sumêg means “forever” in the Yurok tongue, and the village is now used for cultural and educational activities that preserve the tribe’s heritage. Reconstructed family houses in Sumêg Village. The structures are partially underground. 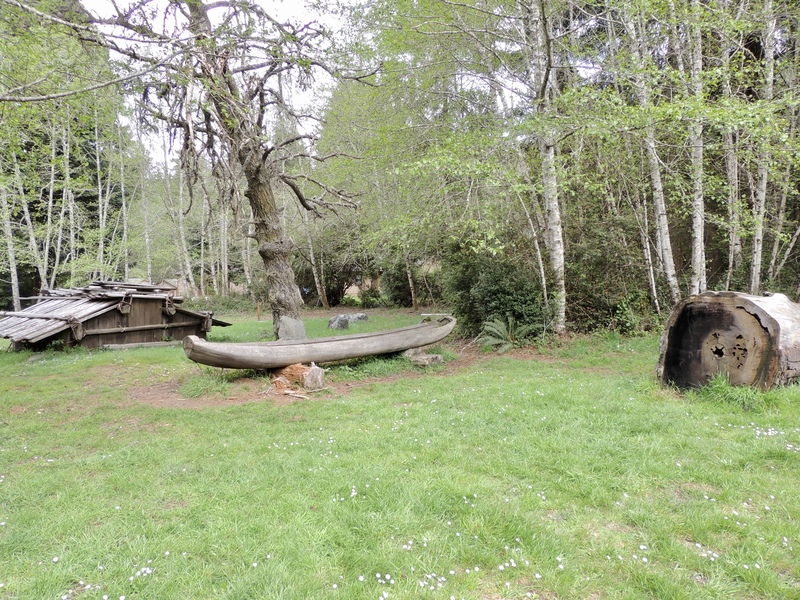 Dressing house and dugout canoe in Sumêg Village. 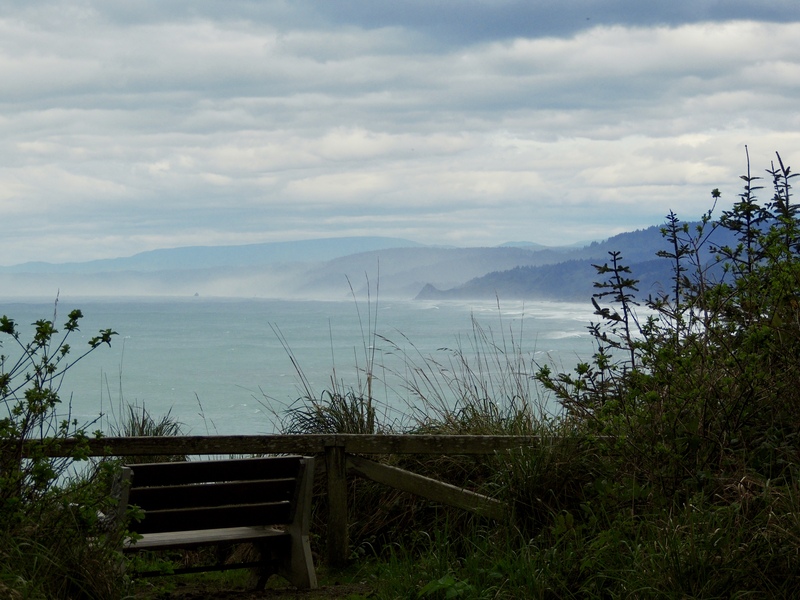 I was rewarded with this beautiful view when I reached the coastline and the eastern end of the Rim Trail. 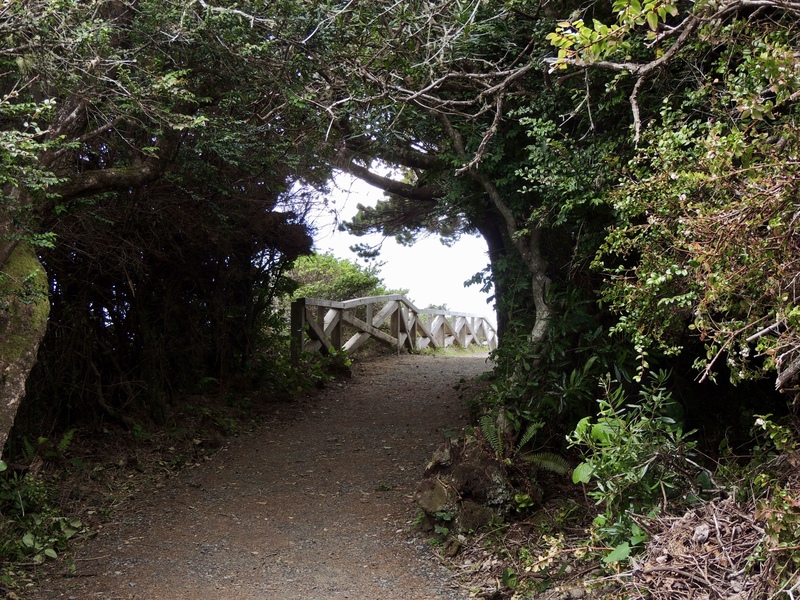 The Rim Trail is an easy 2-mile improved trail that wraps around the edge of the headlands. Most of the trail is several feet wide and covered with gravel embedded in asphalt. It’s fairly level, except for a couple of big steps in an area that looks like it may have washed out recently. 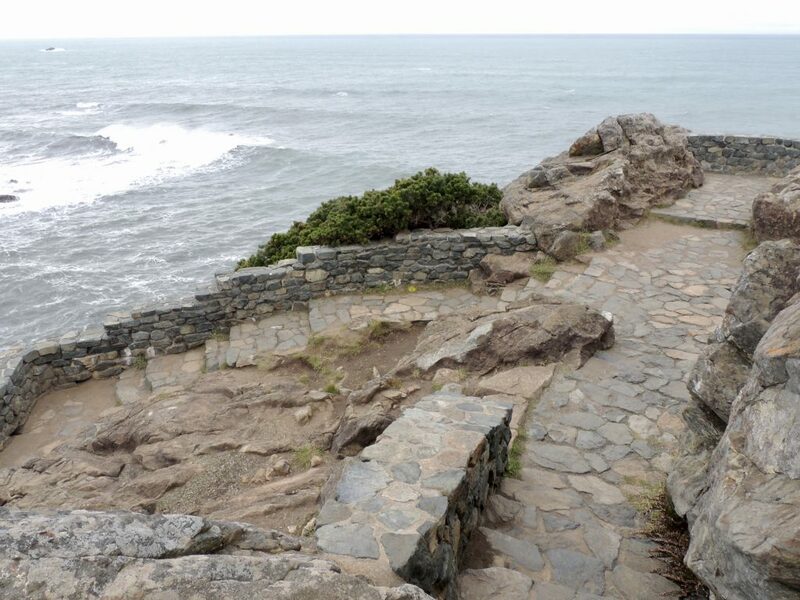 Somewhat steeper side trails lead from the Rim Trail to various overlooks and beach accesses along the cliffs; however, timber or stone steps make these trails easy to navigate as well. 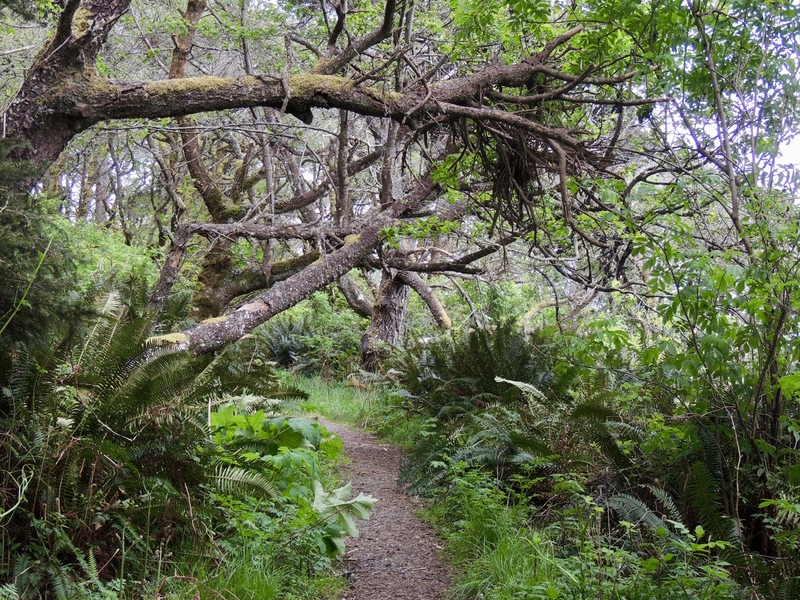 Although portions of the Rim Trail pass through dense forest, there are also many places where it hugs the coastline, giving some spectacular views. 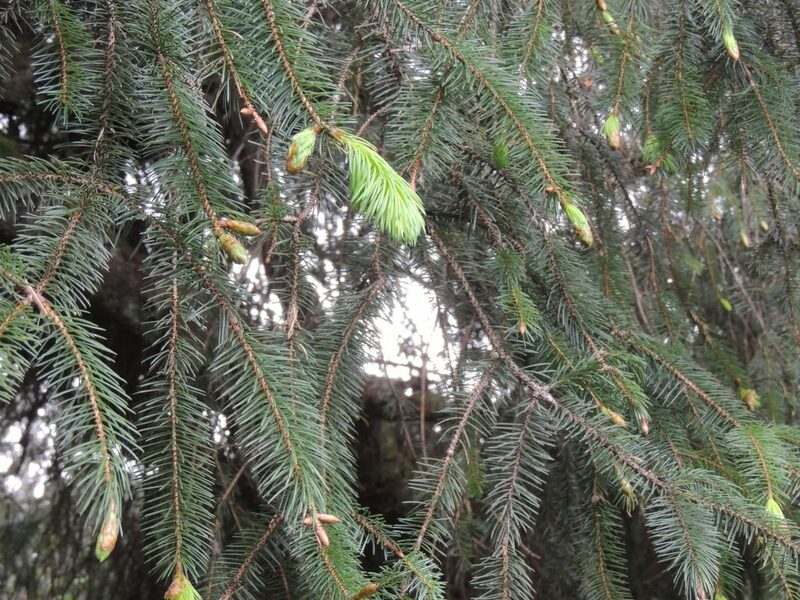 Pine mixed with the smell of rain as the breeze blew. The wind was picking up in advance of the approaching storms, causing the trees around me to sway, creaking and groaning as they did so. At one point, the sound was like an old, squeaky door swinging open, which startled me a bit until I realized what it was. 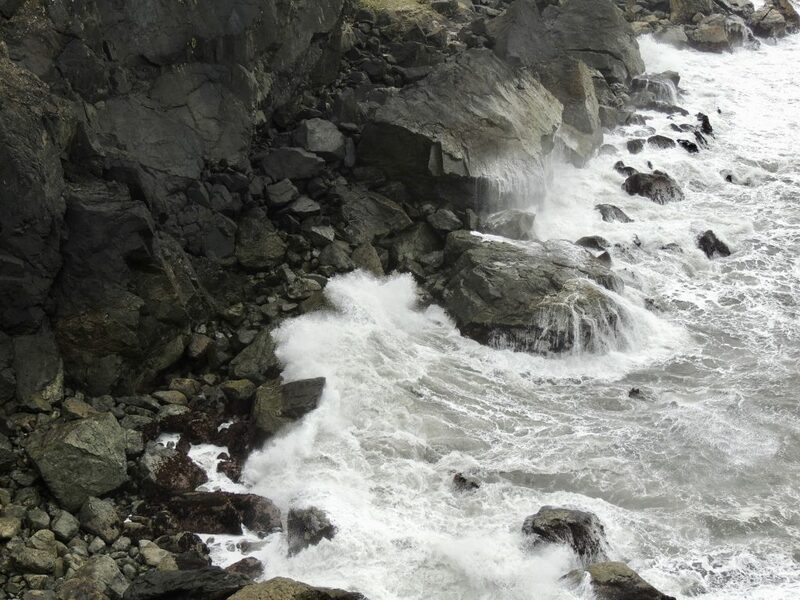 The wind whipped the ocean into heavy surf that pounded the cliffs and rocks below me. About halfway through the Rim Trail, there’s a short spur trail that leads to Wedding Rock, which was for me the highlight of the hike. 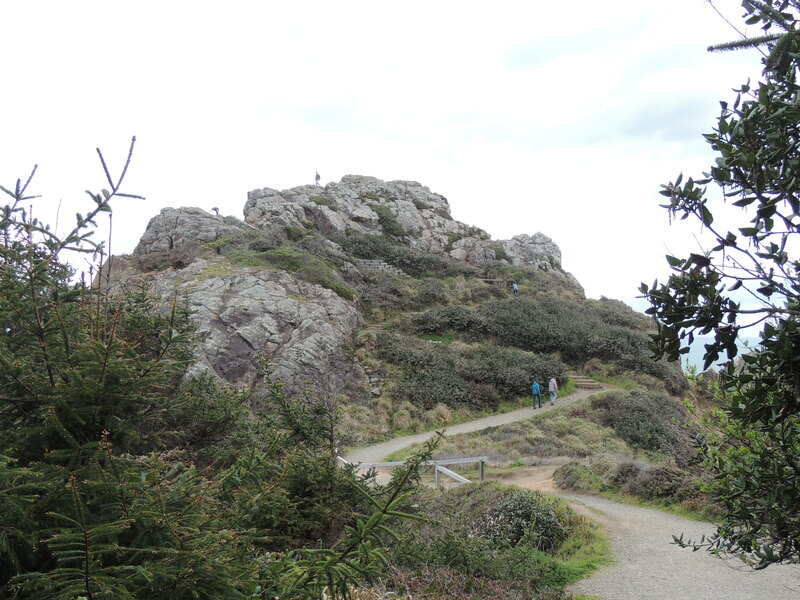 Wedding Rock is an enormous outcropping with a good, stepped trail that leads almost to the top.The climb was a little steep, but made much easier by the timber steps cut into the switchbacked trail, which changed to stone steps near the top. The steps end in several overlooks just below the top, although a few people did clamber up to the rocky summit. 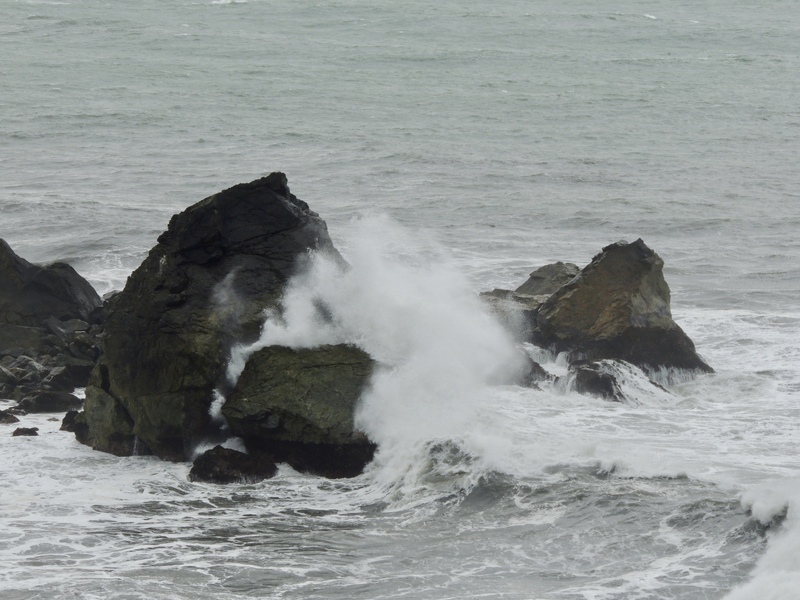 …and the surf crashing on the sea stack rocks below. With the wind picking up and the clouds thickening, I returned to the Rim Trail, and headed to the next overlook at Patrick’s Point. 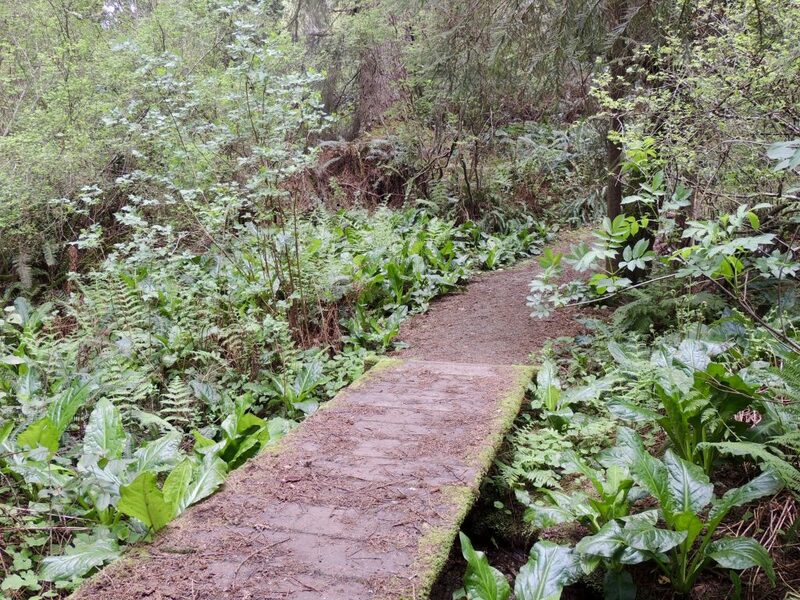 Here, the trail was wide and flat as it passed through the dense forest. 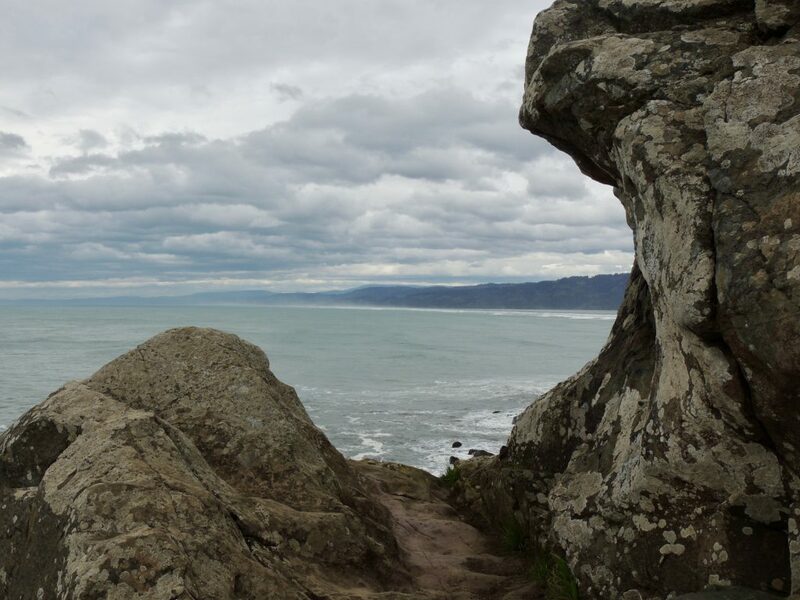 From Patrick’s Point, I was able to get a good look back at Wedding Rock, where I’d been a few minutes earlier. Wedding Rock (viewed from Patrick’s Point, further down the Rim Trail). You can see the trail and overlooks just below the top. Eyeing the threatening skies, I decided to skip Rocky Point, the last overlook on the Rim Trail, and continue to make my way around the rim. The trail was mostly wooded in this area, and I made quick progress, until I reached this sign just past the Abalone Campground. 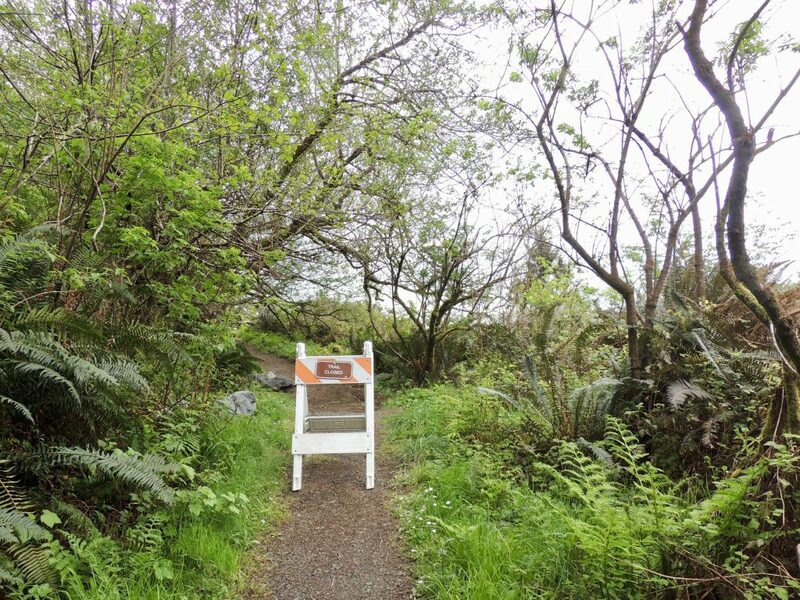 Uh oh…Rim Trail closed for repair. Hmm, I wish they’d placed that barricade further back on the trail. After consulting my trail map, I retraced my steps, crossed Penn Creek, and detoured on a loop that passed near the Campfire Center outdoor amphitheater. 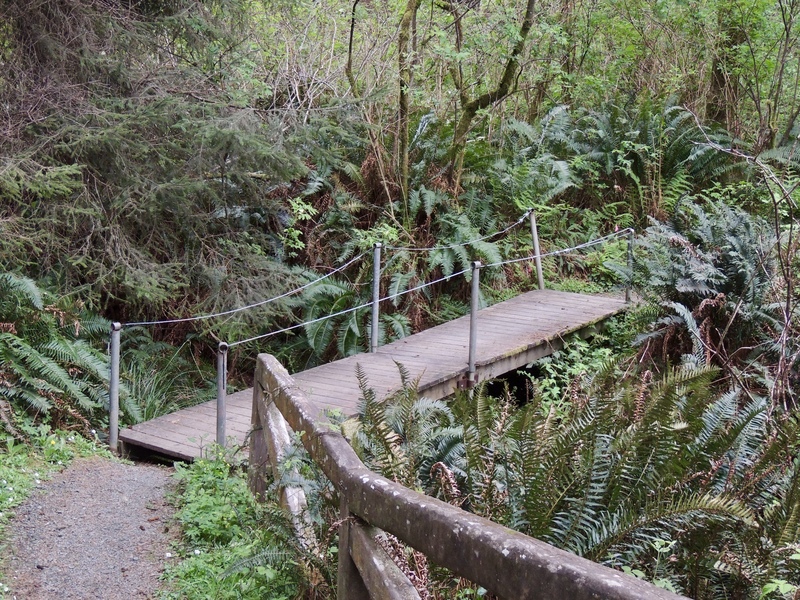 I was hoping that this loop would end past the trail closure, and it did. From there, I passed some California Parks Department crews that were working hard on repairs to the trail in preparation for the tourist season, and came to the southern end of the Rim Trail. The Rim Trail dead-ends into Palmer’s Point Road. If the weather had been better, I would have walked the short distance from there to Palmer’s Point overlook, but instead I followed the road back to the Visitor’s Center and returned to our campsite across Patrick’s Point Drive. Our rig at Azalea Glen RV Park. Check out the flower box! Miraculously, I arrived home about 30 seconds before the skies opened and the rain began. Altogether, I covered 5.9 miles, and saw much of this beautiful State Park. 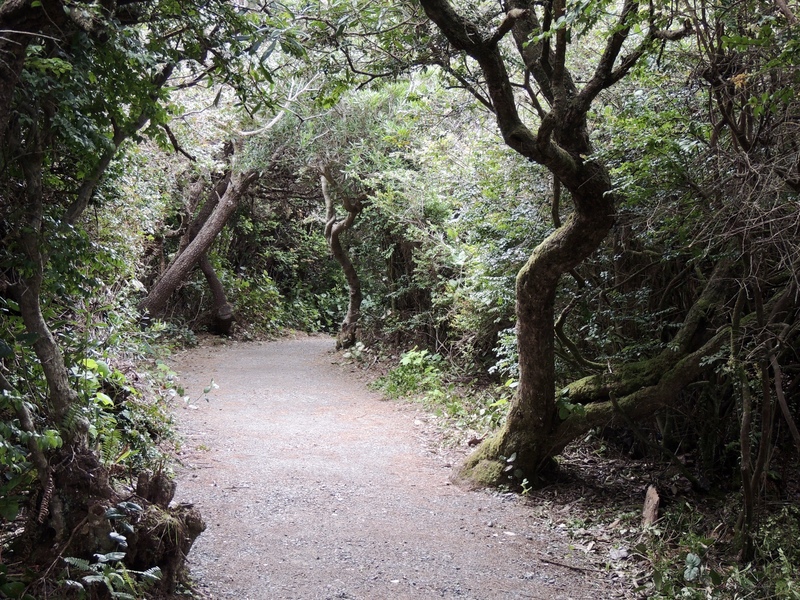 If you want a shorter hike, however, the Rim Trail (and for that matter, most of the other trails at Patrick’s Point) is accessible by road at many points along its 2-mile length, so you can park nearby and walk just some or all of the Rim Trail.